Resembling a rippling pool illuminated by underwater lights, the Egg Nebula offers astronomers a special look at the normally invisible dust shells swaddling an aging star. These dust layers, extending over one-tenth of a light-year from the star, have an onionskin structure that forms concentric rings around the star. A thicker dust belt, running almost vertically through the image, blocks off light from the central star. Twin beams of light radiate from the hidden star and illuminate the pitch-black dust, like a shining flashlight in a smoky room. The artificial "Easter-Egg" colors in this image are used to dissect how the light reflects off the smoke-sized dust particles and then heads toward Earth. Dust in our atmosphere reflects sunlight such that only light waves vibrating in a certain orientation get reflected toward us. This is also true for reflections off water or roadways. Polarizing sunglasses take advantage of this effect to block out all reflections, except those that align to the polarizing filter material. It's a bit like sliding a sheet of paper under a door. The paper must be parallel to the floor to pass under the door. Hubble's Advanced Camera for Surveys has polarizing filters that accept light that vibrates at select angles. In this composite image, the light from one of the polarizing filters has been colored red and only admits light from about one-third of the nebula. Another polarizing filter accepts light reflected from a different swath of the nebula. This light is colored blue. Light from the final third of the nebula is from a third polarizing filter and is colored green. Some of the inner regions of the nebula appear whitish because the dust is thicker and the light is scattered many times in random directions before reaching us. (Likewise, polarizing sunglasses are less effective if the sky is very dusty). 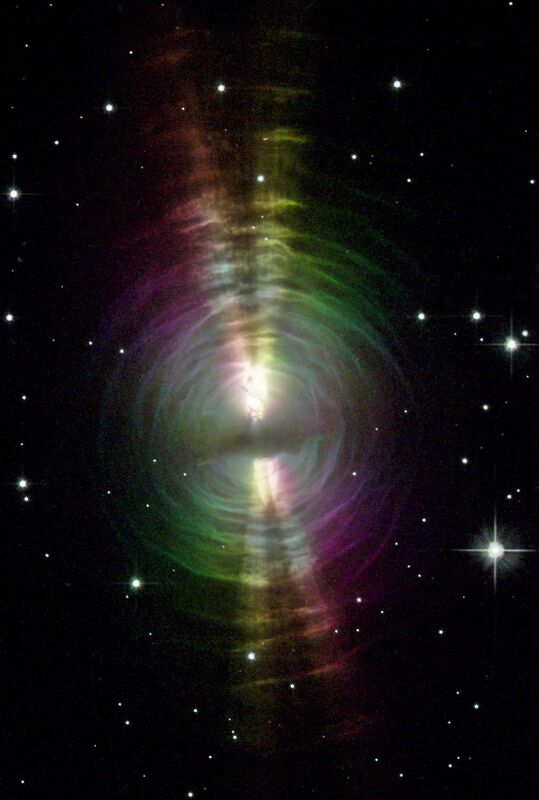 By studying polarized light from the Egg Nebula, scientists can tell a lot about the physical properties of the material responsible for the scattering, as well as the precise location of the central (hidden) star. 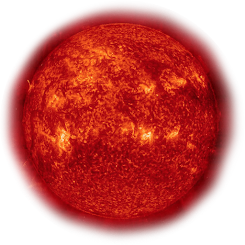 The fine dust is largely carbon, manufactured by nuclear fusion in the heart of the star and then ejected into space as the star sheds material. Such dust grains are essential ingredients for building dusty disks around future generations of young stars, and possibly in the formation of planets around those stars.